The Direct PCR approach presented here facilitates PCR amplification directly from small amounts of unpurified plant and animal tissue. Chum, P. Y., Haimes, J. D., André, C. P., Kuusisto, P. K., Kelley, M. L. Genotyping of Plant and Animal Samples without Prior DNA Purification. J. Vis. Exp. (67), e3844, doi:10.3791/3844 (2012). 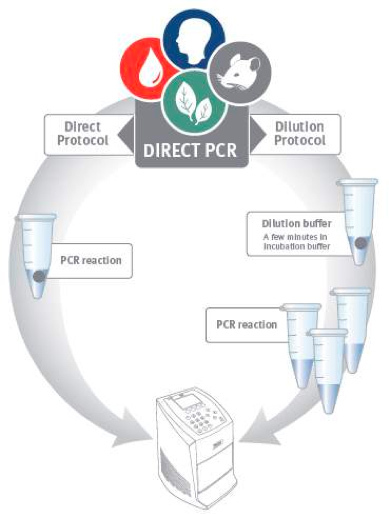 The Direct PCR approach facilitates PCR amplification directly from small amounts of unpurified samples, and is demonstrated here for several plant and animal tissues (Figure 1). Direct PCR is based on specially engineered Thermo Scientific Phusion and Phire DNA Polymerases, which include a double-stranded DNA binding domain that gives them unique properties such as high tolerance of inhibitors. PCR-based target DNA detection has numerous applications in plant research, including plant genotype analysis and verification of transgenes. PCR from plant tissues traditionally involves an initial DNA isolation step, which may require expensive or toxic reagents. The process is time consuming and increases the risk of cross contamination1, 2. Conversely, by using Thermo Scientific Phire Plant Direct PCR Kit the target DNA can be easily detected, without prior DNA extraction. In the model demonstrated here, an example of derived cleaved amplified polymorphic sequence analysis (dCAPS)3,4 is performed directly from Arabidopsis plant leaves. dCAPS genotyping assays can be used to identify single nucleotide polymorphisms (SNPs) by SNP allele-specific restriction endonuclease digestion3. Some plant samples tend to be more challenging when using Direct PCR methods as they contain components that interfere with PCR, such as phenolic compounds. In these cases, an additional step to remove the compounds is traditionally required2,5. Here, this problem is overcome by using a quick and easy dilution protocol followed by Direct PCR amplification (Figure 1). Fifteen year-old oak leaves are used as a model for challenging plants as the specimen contains high amounts of phenolic compounds including tannins. Gene transfer into mice is broadly used to study the roles of genes in development, physiology and human disease. The use of these animals requires screening for the presence of the transgene, usually with PCR. Traditionally, this involves a time consuming DNA isolation step, during which DNA for PCR analysis is purified from ear, tail or toe tissues6,7. However, with the Thermo Scientific Phire Animal Tissue Direct PCR Kit transgenic mice can be genotyped without prior DNA purification. In this protocol transgenic mouse genotyping is achieved directly from mouse ear tissues, as demonstrated here for a challenging example where only one primer set is used for amplification of two fragments differing greatly in size. To begin the dCAPS genotyping assay directly on the Arabidopsis plant leaf, first formulate 20 or 50 μl PCR reactions using the Phire Plant Direct PCR Kit as described in Table 1. Next, cut a 0.50 mm punch from an Arabidopsis plant leaf using the Harris Uni-Core and Harris Cutting Mat. Holding the puncher firmly, press the cutting edge into the tissue and rotate the puncher back and forth. Press the plunger to eject the punch disc into a PCR reaction mixture. Ensure that the sample drops into the PCR solution and does not stick to the tube walls. Clean the cutting edge of the puncher between each sample to prevent cross-contamination by dipping it into 2% NaClO solution. Press the plunger up and down a few times and wipe the cutting edge with a clean paper towel. The cutting mat should also be rinsed between samples. Next, employ a Thermo Scientific Piko 24-well Thermal Cycler and Thermo Scientific Piko PCR Plate to perform the PCR reactions using the cycling conditions described in Table 2. The PCR reactions can also be performed in conventional PCR thermal cyclers. After PCR, spin down the plant material. Transfer 5 μl of the supernatant to a new microcentrifuge tube. Add 4 μl of water and 1 μl of restriction enzyme, SspI. Mix gently and spin down briefly to collect contents in the bottom of the tube. Incubate the reaction mixture for one hour at 37 °C. Inactivate the restriction enzyme by incubating at 65 °C for 20 min. When amplifying DNA directly from plant tissues, the PCR products include plant and PCR-derived components that may interfere with the restriction digestion enzyme. Therefore, it may be necessary to either dilute (e.g. 1:2 or 1:3 in water) or purify the PCR product before the subsequent digestion, for example by using a suitable commercial kit such as Thermo Scientific GeneJET PCR Purification Kit. Following restriction enzyme digestion, analyze the resulting fragments on an agarose gel. Add 2.5 μl of 5x loading buffer to the reaction and perform agarose gel electrophoresis with 10 μl of the resulting mixture. To begin, cut a 2 mm punch of oak leaf. Place the sample into 20 μl of Dilution Buffer supplied with the Phire Plant Direct PCR Kit. Clean the cutting edge of the puncher and cutting mat as before. Crush the leaf sample with a 100 μl pipette tip by pressing it briefly against the tube wall. Depending on the plant material, the dilution protocol sometimes works better without crushing the sample. Spin the samples briefly in a microcentrifuge until the reactions are in the bottom of tubes. The supernatant can be used directly in the PCR, or it can be diluted 1:10 or 1:100 in sterile water depending on the sample type. Use 0.5 μl to 1 μl of the supernatant or dilution as a template for a 20 μl PCR reaction. Prepare the reaction as described in Table 1. Once the reactions are prepared, employ a Thermo Scientific Piko 24-well Thermal Cycler and Thermo Scientific Piko PCR Plate to perform the PCR reactions using the cycling conditions described in Table 2. The PCR reactions can also be performed in conventional PCR thermal cyclers. After PCR, add 5 μl of 5x loading buffer to the reaction and perform agarose gel electrophoresis with 15 μl of the resulting mixture. Begin the dilution protocol on transgenic mice by placing a 2 mm punch of the mouse ear in 20 μl of Dilution Buffer containing 0.5 μl of DNARelease Additive supplied with the Phire Animal Tissue Direct PCR Kit. Incubate the samples at room temperature for 2 min, followed by 2 min incubation at 98 °C. Use 1 μl of supernatant as the template for a 20 μl PCR reaction, prepared as described in Table 3. Any supernatant that is not to be used right away can be transferred to a new tube and stored at -20 °C. Next, employ a Thermo Scientific Piko 24-well Thermal Cycler and Thermo Scientific Piko PCR Plate to perform the PCR reactions using the cycling conditions described in Table 4. Again, the PCR reactions can also be performed in conventional PCR cyclers. Following PCR, add 5 μl of 5x loading buffer to the reaction and perform agarose gel electrophoresis with 15 μl of the resulting mixture. In the dCAPS technique the restriction site within the SNP of interest is either introduced or destroyed using a PCR primer with one or more mismatches to the target DNA. Genotyping of Arabidopsis plant individuals was performed with the dCAPS technique directly from leaf punches. The amplified products were digested and the resulting fragments revealing the genotype of each individual were analyzed by gel electrophoresis (Figure 2). In this example, the 160 bp PCR products containing the SNP site of interest (G or A allele) in the Arabidopsis genome were amplified from plant leaf punches with the Phire Plant Direct PCR Kit. The forward primer contained one mismatch at the 3' end, creating an SspI-specific restriction site in the target DNA, which included the SNP of interest (A allele) but not in the other allele of the SNP (Figure 2B). Dilution protocols are necessary for challenging plant material, such as the oak leaf, due to its high concentration of phenolic compounds. Using the dilution protocol described here, the 297 bp fragment of chloroplastic DNA was amplified using the 3-step protocol. Oak leaf specimens with different dilutions are shown in Figure 3, in addition to positive and negative controls. The Phire Animal Tissue Direct PCR Kit was employed with a challenging protocol where only one primer set was used for amplification of two fragments with a large size difference, resulting in abundant yields of both correctly sized products of 1,500 bp for transgenic mice and 200 bp for wild type mice (Figure 4). The weaker upper band with heterozygote mice is due to the competition of both templates (alleles) for the same primer pair; however, the genotyping results are unambiguous. The stability of the samples prepared using the dilution protocol was also tested. The results show that the dilution samples can be stored at -20 °C for at least one year. Furthermore, repeated freeze/thaw cycles did not significantly affect the reaction (Figure 5). Also shown is the robust amplification from mouse ear tissue samples using Phire DNA Polymerase and the Direct PCR method compared to hot start Taq polymerase and purified DNA (Figure 6). Components 20 μl reaction 50 μl reaction Final Conc. Table 1. Reaction conditions for Plant PCR used in this protocol. Table 2. Cycling conditions for Plant PCR used in this protocol. * The Tm calculator at www.thermoscientific.com/pcrwebtools is recommended when determining the Tm for primers to be used with Phire Hot Start II DNA Polymerase. The recommended annealing temperature for primers ≤ 20 nt is equal to the lower Tm given by the webtool. For primers > 20 nt, use an annealing temperature 3 °C higher than the lower Tm given by the webtool. Components 20 μl reaction Final Conc. Table 3. Reaction conditions for Animal Tissue PCR used in this protocol. Table 4. Cycling conditions for Animal Tissue PCR used in this protocol. Figure 1. 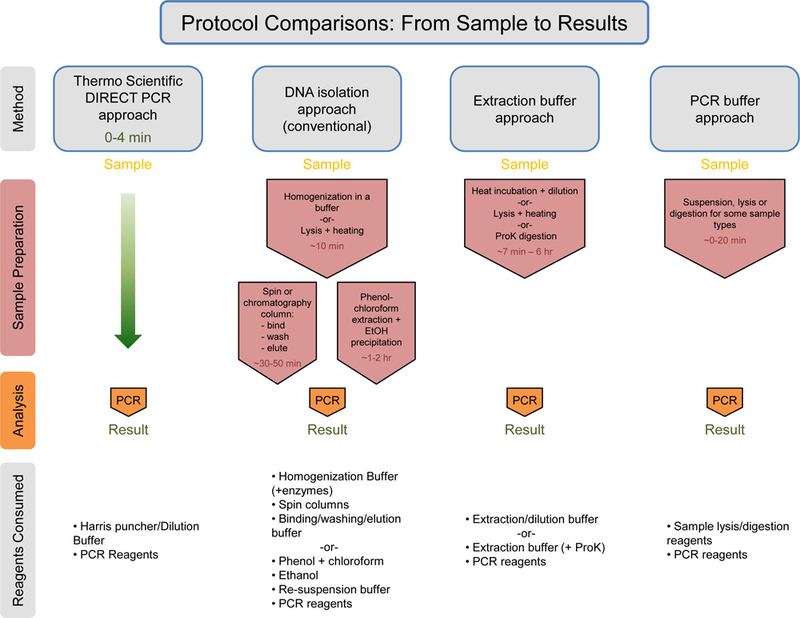 Direct PCR workflow. Direct PCR can be performed using two alternative protocols. In the direct protocol a tiny amount of sample is added directly to the PCR reaction. The dilution protocol employs a brief pre-incubation step before PCR to release DNA from the sample material. Figure 2. Genotyping of Arabidopsis plant individuals with dCAPS technique directly from leaf punches. A) Figure 2A shows the principle of the dCAPS assay performed. The restriction site within the SNP of interest is either introduced or removed by PCR using a primer with one or more mismatches to the target DNA. The PCR products are digested and the resulting fragments reveal the genotype of each individual when analyzed by electrophoresis. B) 0.50 mm punches from plant leaves were placed directly in 50 μl PCR reactions. 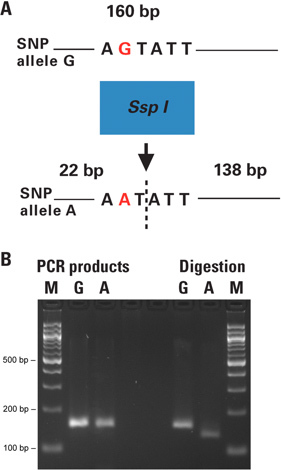 The 160 bp PCR products containing the SNP site (G or A allele) were amplified with primers introducing a unique SspI site to the A-allele. The unpurified PCR products were digested with SspI restriction enzyme. Resulting fragments were analyzed on a 3% agarose gel. Lane M is the size marker; lanes A and G correspond to the SNP alleles of each sample. The obtained results were confirmed by conventional analysis of DNA extraction followed by PCR and restriction digestion (data not shown). The negative control reactions without template DNA were included in test set up and run on a separate agarose gel in parallel with the actual PCR reactions before performing the digestions (data not shown). Figure 3. Dilution protocol using oak leaf samples. The dilution protocol was used to amplify the 297 bp fragment of chloroplastic DNA in oak leaf samples (3-step protocol, annealing at 62 °C) at different dilutions (1:100, 1:10, 1:1 and 2:1) and positive and negative controls [C+: positive control from purified DNA (Arabidopsis), C-: negative control with no template DNA]. The sample nomenclature represents the sample collection site (towns in Finland) and the sample numbering. Figure 4. Genotyping of transgenic mice with one primer pair using the dilution protocol. Ear tissues of nine individual mice (lanes 1-9) were placed into 20 μl of Dilution Buffer including DNARelease Additive. After incubations at room temperature and 98 °C, 1 μl of supernatant was used as a template in the 20 μl PCR reaction. Fragment sizes: 1,500 bp (transgenic) and 200 bp (wildtype). Figure 5. Samples prepared according to the dilution protocol are stable for long term storage. Samples of mouse ear tissues were incubated in 20 μl of Dilution Buffer including DNARelease Additive and subjected to repeated freezing/thawing (lane 1), stored at -20 °C for one year (lane 2), or used immediately for PCR (lane 3). The amplified fragment sizes were 900 bp, 1,500 bp and 3,200 bp. Figure 6. 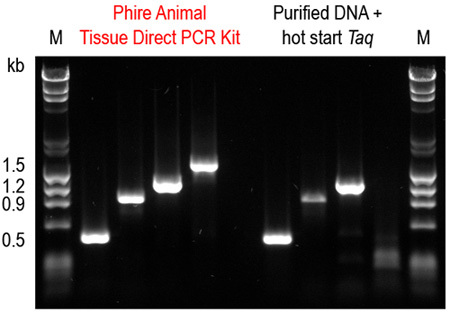 Phire Animal Tissue Direct PCR Kit outperforms a commercial DNA purification system combined with a hot start Taq DNA polymerase. Four amplicons (0.5-1.5 kb) were amplified from mouse ear tissues using the dilution protocol of Phire Animal Tissue Direct PCR Kit. For comparison, DNA was first purified using a commercial DNA extraction kit and the same fragments were amplified using a hot start Taq DNA polymerase according to manufacturers' recommendations. Only with the Phire Animal Tissue Direct PCR Kit were all four amplicons successfully amplified. Figure 7. Universal comparison of the workflow with estimation of times/consumed reagents. Thermo Scientific Direct PCR approach is compared to the DNA isolation approach, the Extraction buffer approach, and the PCR buffer approach. The estimated time for each approach prior to the PCR step is listed in red text. The Thermo Scientific Direct PCR approach takes only 0-4 min for sample preparation prior to PCR. Below each method, the consumed reagents are listed. The Thermo Scientific Direct PCR approach uses the least amount of reagents in comparison to the other methods. Click here to view larger figure. The Direct PCR approach demonstrated here allows for PCR amplification directly from small amounts of unpurified samples, reducing the time needed and simplifying the workflow for plant and animal genotyping (Figure 7). Also demonstrated here is the use of the dilution protocol in combination with the Direct PCR approach (Figure 3). The dilution protocol is recommended with difficult samples (e.g. aged plant leaves, plant species that contain interfering compounds) or with long (or GC-rich) amplicons. This protocol is particularly useful when starting a new Direct PCR experiment, allowing for optimization of the reaction. The protocol can serve as a tool to address occasional difficulties such as low product yields due to differences in tissue material and/or primers used. Furthermore, when running multiple reactions from the same sample, use of the dilution protocol ensures the entire sample is not consumed in one reaction. In order to purify DNA from plants for PCR, the convention was to perform cell lysis followed by DNA isolation using various components that could potentially interfere with PCR analysis8. For particularly challenging plants with high phenolic content, addition of polyvinylpyrrolidone was traditionally used to remove the compounds that bind to DNA following cell lysis2,5. As evident here, these complicated, time-intensive steps can be avoided through use of the Phire Plant Direct PCR Kit to detect the target DNA. Cell lysis and DNA isolation steps can be omitted using the sensitive dCAPS techniques directly from Arabidopsis plant leaves (Figure 2). As demonstrated here, the dilution protocol effectively manages the presence of problematic components that can interfere with PCR (Figure 3). Traditionally, a prerequisite to animal genotyping was isolation of genomic DNA from animal tissue through a toxic, time-consuming process characterized by a lengthy incubation with proteinase K to digest skin and connective tissue, followed by organic solvent extraction, alcohol precipitation, and centrifugation steps6,9,10. As demonstrated here, simplification of this process is achieved through use of the Phire Animal Tissue Direct PCR Kit, allowing transgenic mice to be genotyped without prior DNA purification (Figure 4). The example demonstrated in this article is particularly challenging as only one primer set was used for amplification of two fragments with a large size difference. Despite the protocol's innate difficulty, use of the Direct PCR approach in conjunction with the simple dilution protocol resulted in high yields of the two PCR products (Figure 4). PCR-based target DNA detection has many applications in research, including genotype analysis to identify the roles of genes in development, physiology and disease. Due to the inhibitor tolerance of the specialized DNA polymerases, the protocols can be completed in minimal time without prior DNA purification. Production and Free Access to this article is sponsored by Thermo Fisher Scientific, Inc.
For the Arabidopsis samples and the concerned PCR primers we thank Professor Jaakko Kangasjärvi and his group, The Plant Stress Group, Plant Biology, Department of Biosciences, University of Helsinki. The experiments with the traditional method were conducted by Mrs. Airi Lamminmäki. Transgenic mouse samples were provided by Dr. Jaana Vesterinen, Institute of Biomedicine/Biochemistry, University of Helsinki. Harris Uni-Core and Harris Cutting Mat are trademarks of Shunderson Communications Inc. All other trademarks are the property of Thermo Fisher Scientific Inc. and its subsidiaries. Doyle, J. J., Doyle, J. L. A rapid DNA isolation procedure for small quantities of fresh leaf tissue. Phytochemical Bulletin. 19, 11-15 (1987). Kim, C. S., Lee, C. H., Shin, J. S., Chung, Y. S., Hyung, N. I. A simple and rapid method for isolation of high quality genomic DNA from fruit trees and conifers using PVP. Nucleic Acids Research. 25, 1085-1086 (1997). Neff, M. M., Neff, J. D., Chory, J., Pepper, A. E. dCAPS, a simple technique for the genetic analysis of single nucleotide polymorphisms: experimental applications in Arabidopsis thaliana genetics. The Plant Journal. 14, 387-392 (1998). Michaels, S. D., Amasino, R. M. A robust method for detecting single-nucleotide changes as polymorphic markers by PCR. The Plant Journal. 14, 381-385 (1998). John, M. E. An efficient method for isolation of RNA and DNA from plants containing polyphenolics. Nucleic Acids Research. 20, 2381-23 (1992). Wang, Z., Storm, D. R. Extraction of DNA from mouse tails. BioTechniques. 41, 410-412 (2006). Malumbres, M., Mangues, R., Ferrer, N., Lu, S., Pellicer, A. Isolation of High Molecular Weight DNA for Reliable Genotyping of Mice. BioTechniques. 22, 1114-1119 (1997). Yang, Y., Kim, J. Y., Soh, M. S., Kim, D. S. A simple and rapid gene amplification from Arabidopsis Leaves Using AnyDirect system. Journal of Biochemistry and Molecular Biology. 40, 444-447 (2007). Sambrook, J., Fritsch, E., Maniatis, T. Molecular Cloning: A Laboratory. 2nd ed, CSH Laboratory Press. Cold Spring Harbor, NY. (1989). Meldgaard, M., Bollen, P. J. A., Finsen, B. Non-invasive method for sampling and extraction of mouse DNA for PCR. Laboratory Animals. 3, 413-441 (2004). Good afternoon, may I have the complete article for this kit? I would like to promote it to the customers in Indonesia.